The following comments about attractions in Nottingham have been posted from individuals. We believe that the best reviews of Nottingham, England are written by travellers and holiday makers who have experienced Nottingham first hand and want to share their thoughts. Can you share yours? Please help us expand this section of our Nottingham World Guide. 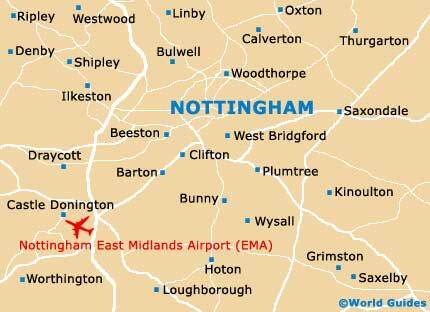 Let us know what you think about the attractions in Nottingham, England. Submit comments about Nottingham attractions here. It is sad that the Tales of Robin Hood attraction on Maid Marion Way closed in 2009, following a huge hike in its rent by its landlord - Tescos. Whilst this may have needed a cash injection to get it back to its former glory, it is nevertheless a huge shame to see it close its door, despite so much petitioning and general support from the locals. I'm sorry that the council have let this happen. If you are visiting Nottingham, then have a pint or a bite to eat in Ye Old Trip to Jerusalem, which is amazingly the UKs oldest pub. It is around 800 years old and is actually built right into the adjanceent sandstone cliffs, with kind of caves inside. Nottingham Castle and the Robin Hood statue are very nearby, so you've got no excuse to miss it! It was a real highlight for me when we sat outside, although it was a very sunny day. The Nottingham Ghost Walks take place each Saturday and start outside of the Salutation Inn, at 19:00, near to the Maid Marian Way. They cost around £4 per adult, half that for children, and last just over an hour. It was fun and our guide told us some great spooky stories about the city's past and present hauntings. You also get to visit lots of good places, so it's a bit like a sightseeing tour, with a ghostly twist. Very enjoyable. The Galleries of Justice have been used as a court and prison for hundreds of years and are now a much underrated attraction. There area all kinds of interesting exhibitions, and we enjoyed our experience of a Victorian court in action. It is in the Lace Market area of Nottingham and there is a heritage trail around this part of the city, with free audio equipment available to make it more interesting. Unfortunately though we ran out of time, but it looked good. Please note that these Nottingham, England comments and reviews are posted by individuals and are not necessarily the views of World Guides.